This naturally sweet vegetable is packed with healthy nutrients that provide a plentiful amount of health benefits. Although many group sweet potatoes with yams or potatoes, the sweet potato belongs to its own group and because of this, they show different health benefits. Sweet potatoes come in a variety of colors. The skin and flesh can be anywhere from white, cream, and yellow, to orange, pink, or even deep purple. Sweet potatoes provide a sizable amount Vitamin A, Vitamin C and beta-carotene which makes them a good antioxidant food. In purple-fleshed sweet potatoes, antioxidant anthocyanin pigments are abundant, not only in the skin of the food but also in the purple-flesh. 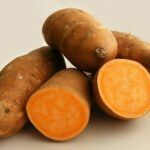 The cyanids and peonidins and other color-related phytonutrients in the sweet potato that act as antioxidants have shown to lower potential health risks caused by heavy metals and oxygen radicals. This is good for those trying to reduce heavy metal residues in their diet as well as those with digestive tract problems like irritable bowel syndrome or ulcerative colitis. Storage proteins, called sporamins, in sweet potatoes also have important antioxidant properties. Anthocyanin and other color-related pigments present in the sweet potato have been shown to provide anti-inflammatory health benefits. This can be seen in reduced inflammation of brain tissue and nerve tissue throughout the body. The color-related phytonutrients also impact fibrinogen which is a glycoprotein required for successful blood clotting. Fibrinogen in excess in the body can cause many health risks by causing problems like multiple sclerosis. Eating sweet potatoes reduces inflammation while simultaneously reducing fibrinogen levels, keeping them at a normal level. Unlike most starchy foods which are converted into simple sugars in our digestive tract, sweet potatoes regulate our blood sugar. It has even been shown to improve blood sugar for those with type 2 diabetes. Sweet potatoes have been shown to increase blood levels of adiponectin in persons with type 2 diabetes. This is a protein hormone produced by our fat cells and is and important modifier of insulin metabolism. People with health insulin metabolism will therefore have higher levels of adiponectin. Sweet potatoes also contain the nutrient group, resin glycosides. These are sugar-related and starch-related molecules which have antibacterial and antifungal properties. Sweet potatoes contain many other nutrients like manganese, fiber, B vitamin and even iron, as well as dietary fibers that are essential for your health. Sweet potatoes are also good for those who smoke of have emphysema because they replenish the Vitamin A deficiency. Sweet potatoes have a high concentration of nutrients and contain fiber. One of the many nutrients in sweet potatoes is vitamin A. Vitamin A is an important antioxidant that fights diseases and supports a healthy immune system. Also, it can help protect against sun damage. Another vitamin found in sweet potatoes is vitamin B6. Since the body uses this vitamin to break down homocysteine, eating this super food can prevent the hardening of the blood vessels and arteries. Potassium, also found in sweet potatoes, is known to lower blood pressure by balancing the fluids in the body. On top of all the benefits this root provides for the heart, it also has a low glycemic index. This means that it helps to prevent sugar spikes and regulate energy levels. Interestingly, sweet potatoes even have this effect on those who are affected by type 2 diabetes. Other vitamins and nutrients found in sweet potatoes have been found to have positive affects on immunity and inflammation, skin and hair, digestion, and have even been found to have anti-carcinogenic properties. For those with kidney or gallbladder ailments, talk to a doctor about whether you can eat sweet potatoes. Sweet potatoes contain small amounts of oxalates which can cause kidney damage. Those with a healthy digestive tract will be able to absorb the healthy beneficial nutrients while avoiding ill effects of the oxalates. “What are the Health Benefits of Eating Sweet Potatoes or Yams?” Ipatenco, Sara.SFGate, n.d. Web. 18 June 2013. “Facts on the Health Benefits of Sweet Potatoes” ” O’Brien, Maria. Livestrong, 5/18/2011. Web. 18 June 2013. “Seven Health Benefits of Sweet Potatoes” Eat This!, 5/31/2011. Web. 18 June 2013. “Sweet Potatoes” The World’s Healthiest Foods, n.d. Web. 18 June 2013. “Sweet Potato Nutrition Facts” N.p., n.d. Web. 18 June 2013.